Jim Jake with ski boots. at the Ski and Sport Chalet. 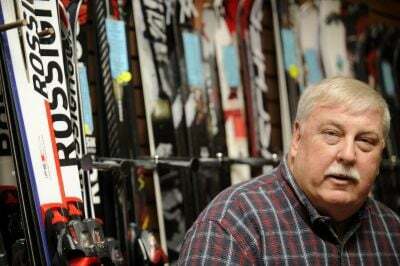 Jim Jake at the Ski and Sport Chalet in Kenosha organizes trips that appeal to older skiers. At age 69, Jim Jake doesn’t speed down the ski slopes as he once did. But he still enjoys the rush of cutting through the powder, taking on the challenge of a run down a mountain. 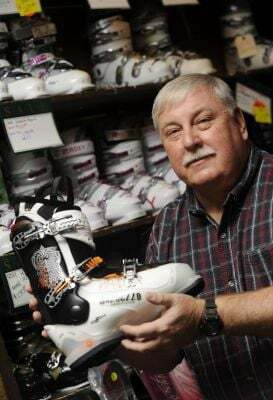 Jake, who operates Ski & Sports Chalet, 5039 Sixth Ave. in Kenosha, has enjoyed the sport of skiing for 50 years. He is planning a ski trip to Austria this March, joined by two dozen other skiers 65 and older — as well as some younger skiers. Some of the senior skiers have had hips and knees replaced. Some of them have had heart surgery or other serious health problems. But out on the slopes, they may feel decades younger as they slalom down the hill. Jake said he loves the sport too much to consider giving it up. He stays in shape for ski season by riding a bicycle regularly. He is among a group of other skiers (ages 50-75) who meet for a long bike ride once a week during the off-season. “We ride for 10 miles and talk skiing,” he said. It’s common for ski clubs to offer bike trips as part of their summer activities. Other senior skiers exercise at a health club or walk to stay in shape for skiing. “Skiing is so much fun. They want to keep it part of their lifestyle,” Jake said. Advances in skiing equipment have made it possible for people to continue skiing well into their retirement years, Jake said. Others were able to return to the sport after giving it up. Until about nine years ago, skis were longer and skinnier than today’s models. The old style skis required more work from the athlete: “a lot of hopping, twisting and turning your body,” Jake said. Jake said he noticed the difference immediately when he switched to the new style of skis. Skiing a long run was no longer as tiring. Thanks to the improved equipment, skiing is now accessible to almost every age group, Jake said. He knows plenty of skiers in their 70s, and some skiers in their 80s, including an Illinois resident who still races at age 87. There are advantages to skiing later in life — people have the money and the time for trips such as the Austria tour. The 11-day trip includes four days of skiing, interspersed with sightseeing tours to Salzburg, Vienna and Munich. Where’s the best place to ski? Jake said Utah ski resorts have the lightest, deepest, fluffiest snow. It was his favorite destination in his younger years. Now, he prefers the luxury of resorts in Aspen and Vail, Colo., in the U.S., and European destinations such as Austria. In 2010, he led a ski trip to Lake Tahoe, where two-thirds of the participants were over 60. Good, enjoyable skiing also can be found close to home, including Wilmot Mountain in Kenosha County, Alpine Valley Resort in Elkhorn and the Grand Geneva Ski Resort in Lake Geneva. Before embarking on a week-long ski vacation, Jake recommends skiing locally two or three times during the season to become re-accustomed to the sport. Jake hopes to continue skiing indefinitely.